Saint Ann Catholic School is a parochial elementary and middle school in Fayetteville, North Carolina. We are part of the Saint Ann Catholic Parish and the Diocese of Raleigh. Contact us today! The story of St. Ann School begins in much the same way as the story of St. Ann Church. From the desire to share their faith with the youth of the community, regardless of race, the parishioners of St. Ann, along with their pastor Father Edward Moan, O.M.I. sought the addition of a school to the growing St. Ann community. From the very beginning, the mission of the St. Ann community to start a school had the full support of Vincent S. Waters, Bishop of Raleigh. Within the archives of the Sisters of Providence there is a letter from the bishop to Mother Gertrude Clare, Superior General, dated March 14, 1956. Within this communication, Bishop Waters shared the plans of the new St. Ann School, while also reminding Mother Clare of her promise to send three of her sisters to staff the school in September of that year. Bishop Waters recognized the need for the school not just for the community immediately surrounding St. Ann Church, but from the Ft. Bragg area as well. He writes, “No better work can be done in the country than that done in the mission parishes of Fayetteville where the Service personnel from all over the country are being helped by parochial schools.” In her reply, Mother Gertrude expressed her intent to keep her promise in sending three sisters for St. Ann in the fall. Not long after her reply, dated April 2nd, ground was broken for the school on June 3. On the Feast of the Assumption (August 15, 1956), Sister Marie Stephanie, Sister Agatha, and Sister Ann Jeannine were officially appointed to St. Ann School. Two days later, on August 17th, the sisters arrived in Fayetteville as promised. Along with Father Moan, the sisters visited St. Ann School, which, at that point, was still under construction. Before settling into their convent, the sisters dedicated the school to the Divine Teacher and our Blessed Mother while in the presence of the Blessed Sacrament. Father Moan led them in the act of consecration. Classes at St. Ann School officially began on September 4, 1956. From its foundation, St. Ann was to be an integrated school. The parents of the first groups of students through the doors cared more that their children received a Catholic education, than they did about the culture of the time. The first enrollment for that year included 102 children in grades K through 6. Of those children, 69 were Catholic and 33 were non-Catholic; 54 students were African-American and 48 were white. It was December 17th of 1956 when Bishop Waters made a surprise visit to St. Ann School. As he walked through the classrooms, he expressed his pleasure at how well the Sisters had made progress with the school. The integration of the student body was particularly pleasing to him. Ten children were a part of the first Confirmation class of St. Ann on February 17, 1957. The Most Reverend James Navaugh administered this sacrament. -The first graduating class of ten 8th graders were awarded their diplomas at the end of the 1958-59 school year. -A bus was used to transport kindergarten students from St. Ann to their homes on Ft. Bragg. On March 8th of 1960, this bus was struck by a truck on the way from St. Ann. Children on board the bus were taken to Womack Hospital for treatment of cuts and bruises, though one young girl had a broken leg. -The last graduating kindergarten class took place on May 29th, 1960. The kindergarten class was discontinued so that another classroom could be opened the following August. This was an effort to eliminate triple grades. -The pastor of St. Ann received word from the bishop during the 1961-62 school year that four additional classrooms must be added to the school immediately. One year later, the required four classrooms, new lavatories, a lounge for the lay teachers, and a janitor’s supply closet were added to the school, much to the amazement of everyone. There were double grades that year in 5th through 8th grade. -Student enrollment was the highest during the 1963-64 school year with 285 students enrolled in grades 1-8. -For an unknown reason, grades 7 through 9 were transferred to St. Patrick’s School in 1964. Seventh grade students would return to St. Ann for the following school year (1965-66). -A single class for each grade was established during the 1966-67 school year in grades 1-8. Enrollment then was 275 students with four Sisters of Providence and four lay teachers. -Given the need, in the 1968-69 school year, a Parent Handbook was issued for the first time. It laid out all the valuable information that parents would need with regard to school regulations. -Grades seven and eight were again discontinued at the end of the 1971-72 school year. The departure of the Sisters of Providence in 1972 stemmed from conflicting ideas with Bishop Waters. Their withdrawal from the community put the future of St. Ann School in question. To continue the school, two sisters from the Diocesan office were sent to lead the school until a more permanent solution could be found. A solution came for the 1973-74 school year when Bishop Waters appealed to the Daughters of Charity of Emmitsburg, Maryland. Two sisters from the community were sent to staff St. Ann. Sister Joan Keating was the principal and Sister Janice Davin was assigned to the first grade. Five lay teachers completed the faculty that year. Grades 1-6 were the only grades offered at that time. During their first year, the Daughters of Charity administered the Ginn 360 Initial Screen Test to all students in grades 2-6 to determine proper reading level placement for each student. The math course was reviewed that year as well. Determining that the math course was poor, the students were again tested to prepare them for the Addison-Wesley Math program in August of 1974. Also during their initial year, there was a remarkable growth in the relationship between parents and teachers. There were many happy events that year that brought teachers and students together as well. From an All Saints Pageant and a Christmas program, to a celebration of National Brotherhood Week with a local public school and a track meet in Greenville, St. Ann flourished. In the following year, with enrollment at 172 children in grades 1-7, St. Ann School continued to improve in the curriculum that was taught to students. There was also a first for the school—parent-teacher conferences. After the first report card, students joined their parents in meeting with their teachers. Also that year, on April 4th, Bishop Gossman confirmed 50 children. The Daughters of Charity would continue to serve St. Ann School for the next 30 years. Of their many good works for the school, the establishment of the Neighborhood Youth Center is one of their most notable achievements. Under the leadership of Sister Joanne Goecke, they established the youth center to serve area neighborhood children who were considered at risk. This program paired at-risk children with volunteer tutors from the local community. The program offered after-school tutoring, as well as a hot meal and transportation home on Tuesdays and Thursdays. Because of the success of the program, and an ardent desire for the program to grow and continue, donations from generous donors allowed for the construction of a new wing of the school in 2002. Housing the Neighborhood Youth Center office, as well as a multi-purpose room, two classrooms, a teacher’s lounge and restrooms, this new wing became the heart of the after-school tutoring program. Sitting perpendicular to the original school building, this new wing was a welcome addition. The Neighborhood Youth Center continues to thrive to this day. Other improvements have been made to the school grounds since the construction of what is now considered the middle school wing. A wrought iron fence was erected around the entire property in 2006. Replacing an old chain-link fence that had previously surrounded the property, this new fence added a greater sense of security for the children while playing on playground equipment at recess that had also been replaced at a previous time. The new fence was made possible by Ltc. (Ret.) Oscar Lewis, a St. Ann parishioner, and his wife who made his donation in honor of his late daughter. In 2006, the St. Ann family celebrated the 50th anniversary of the school. There were many activities planned for the year-long celebration. From representing the school in the Fayetteville Rotary Christmas Parade that year, to once again holding an Easter egg hunt on the school grounds, St. Ann reminisced about the past while keeping their eyes to the future. The 50th anniversary year would bring much celebration, but at the same time, it brought about the end of an era. It was during this year that the Daughters of Charity announced that they would be leaving St. Ann to continue their mission elsewhere. The announcement did not come with news of another religious order taking their place, indicating that for the first time in its 50 year history, St. Ann School would be staffed entirely by lay teachers in the coming school year. A principal search committee was soon formed to find a new leader of the school. In August 2007, Rene Corders was selected as the new principal of St. Ann School. As a retired high school principal from Cumberland County, Ms. Corders brought a wealth of experience to St. Ann. Though she has the ability to lead the teachers and students in an exceptional way, it is her own history with St. Ann School that is perhaps at the center of what makes her truly dedicated to her role at the school. Ms. Corders, herself an alumnus of St. Ann, has been here through her years as a student, and now as a parishioner involved in many parts of the mission of St. Ann. Since her appointment as principal, Ms. Corders has made many improvements to the school. She implemented a pre-kindergarten class, which opened the doors to a younger generation of students for the first time. Additionally, she made sure that the middle school only consisted of 6th-8th grades. In previous years, 4th and 5th graders had been considered a part of the middle school. Recognizing that technology is continually changing, Ms. Corders also completely removed the computer lab. With the fundraising help of the School Volunteer Organization, 50 new touchscreen laptops were purchased for the school in 2015. These mobile computers made it easier for students to use this technology in their own classrooms, which would maximize the potential for learning. Interactive white boards and projectors were also installed in every classroom. Among many other changes that were for the benefit of the school, Ms. Corders also worked with the director of the Neighborhood Youth Center to begin a volunteer commitment for the middle school students. She implemented a mandatory number of hours that each middle school student must complete each year with the youth center. Her belief that students should know how to give back was strong. Ms. Corders also put together a School Improvement Team. This committee was made up of teacher representatives from the elementary and middle school departments, parents, alumni, and a student. These stakeholders would meet nearly every month to develop a School Improvement Plan that would help the school with the reaccreditation process. Even during years between accreditation visits the team would gather to reevaluate the plan and determine what has been accomplished and what still needs to be done. 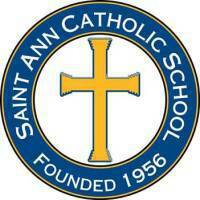 Now in its 60th year, St. Ann School is once again celebrating an anniversary. With students sporting anniversary t-shirts on the first Wednesday of every month, the school is again peering into the past while staying focused on the future. Technology will certainly change, as it does continuously, making the new laptops obsolete in a few years, but what will hopefully remain the same about St. Ann is the mission. During the last accreditation cycle, a new mission statement was collaboratively written by the faculty. The final line of this statement is what is at the heart of St. Ann School: students enter to learn and depart to serve.